With so many sweet treats and heavy dishes typically eaten during the holidays, it’s nice to have a meal that’s guiltless, yet still satiating and packed with flavor. When creating a Christmas menu, I like to think of dishes that are vibrant, festive, and that I’m sure everyone will love. Denying yourself and your loved ones those holiday favorites is never fun, so I say, don’t do it! Instead, opt for healthy, quality ingredients to incorporate into your holiday menu. One of the easiest ways to do this is to simply swap olive oil for saturated fat in your favorite recipes. Olives are grown in many countries around the world, but Spain is home to the largest variety of olive trees, with more than 260 varieties grown over more than 2.5 million hectares (nearly 6.2 million acres). Among these different varieties is a wide range of flavors, aromas, and textures. Did you know that 1 of every two bottles of olive oil consumed in the world are Olive Oils from Spain? The right varietal of olive oil is a matter of personal taste, and olive oil producers will often blend varieties to create a certain flavor profile. Light and fruity olive oils, such as Arbequina, are typically best in homemade mayonnaise, desserts, and for shellfish and poultry dishes. The more intense, fruity olive oils (look for Cornicabra, Hojiblanca, and Picual varieties) are great paired with more hearty foods like meats, cruciferous vegetables, salads, and oily fish. Have you ever had an olive oil with a strong peppery, almost bitter flavor, or one that even makes you cough? That’s a good thing! A young oil that has been recently pressed will often have these healthy characteristics. This is due to the abundant presence of polyphenols, an antioxidant that helps fight free radicals and may help prevent age-related diseases, certain cancers, high blood pressure and cholesterol. Regardless of the variety you choose - be it a milder Arbequina or an intense Picual - all olive oils contain numerous health benefits and are easily incorporated into your diet. With its wide ranging flavor and texture profiles, it’s no wonder some of the world’s best chefs use only Olive Oils from Spain in their cuisine. Olive oil is also an integral part of the Mediterranean Diet, a healthy eating lifestyle that’s rich in fruits and vegetables, whole grains, lean sources of protein - such as fish and poultry - and low in saturated fat. Research has shown that adopting this Mediterranean-style of eating may benefit in weight loss, maintain healthy blood sugar levels, reduce inflammation (a risk in Alzheimer’s disease, heart attacks, and strokes), and more. Spain has one of the longest life expectancies in the world (and people with some of the most beautiful skin and hair!) and it’s largely due to the ubiquitous consumption of olive oil. Many people think of salad dressing when they think of olive oil, but olive oil extends far beyond salads and can easily be used as your primary fat in both cooking and baking - even in your daily beauty routine. In the winter, when my skin is dessert dry due to the cold weather, I rub olive oil on my skin before bed. I love to use some of the more intensely flavored varietals, such as Picual, as a finishing oil on some of my dishes. Try a drizzle on top of soups and stews, over veggie-loaded flatbreads and pastas, even a tablespoon or two in your morning smoothie. Frying in olive oil, one of the oldest methods of cooking in the world, creates a thin and crunchy barrier-like outer layer which prevents the food from absorbing too much oil, thus making the food lighter, juicier, and easier to digest. 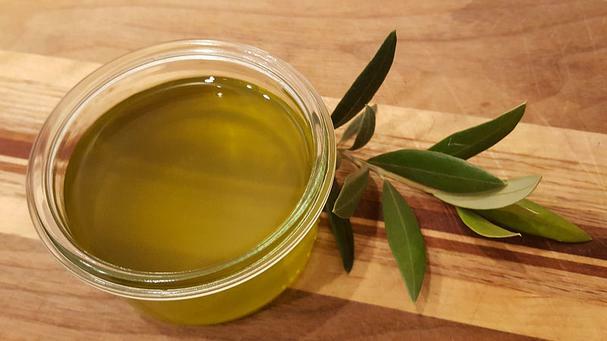 And, unlike other oils, if you properly filter the olive oil you can reuse it up to 4 more times! If you love to bake, start using a lighter flavored olive oil in lieu of other fats, such as vegetable and canola oils. Olive oil lends a wonderfully nutty flavor to quick breads, brownies, muffins, and cookies. It also enhances the flavors in fruit and vegetable loaves like banana, zucchini, and pumpkin breads. 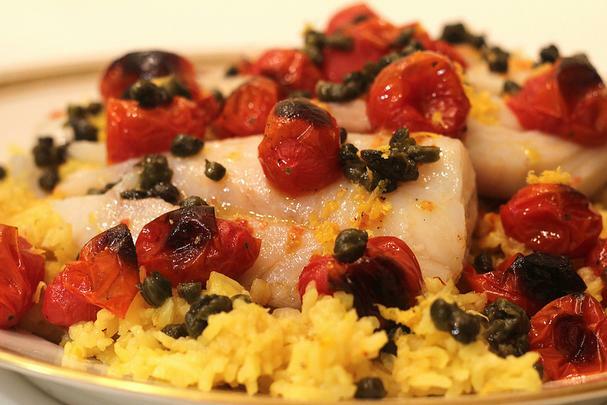 This Christmas Eve I’m making my family a deliciously tender dish of Extra Virgin Olive Oil Poached Cod topped with Roasted Tomatoes and Lemony Fried Capers. Poaching in Extra Virgin Olive Oil (an easy method of gently cooking fish in liquid over low heat) results in silky, luxuriously textured fish with little effort. 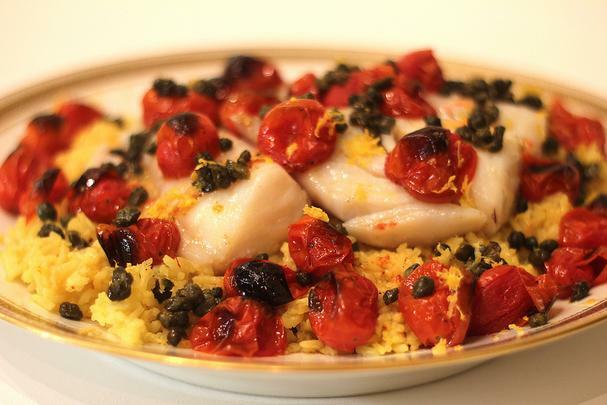 The flavorful poached cod is simply wonderful served over buttery saffron rice and topped with sweet roasted tomatoes and a sprinkling of lemon zested crispy fried capers. It’s a beautifully vibrant dish that wows guests, yet quite simple to make! Timing: For best results, the cod should be at room temperature before cooking, so let it rest on the counter for an hour before you start cooking. Once you’re ready to begin cooking, start with the rice, then move on to the cod (the rice can be kept warm as you prepare the rest of the dish). 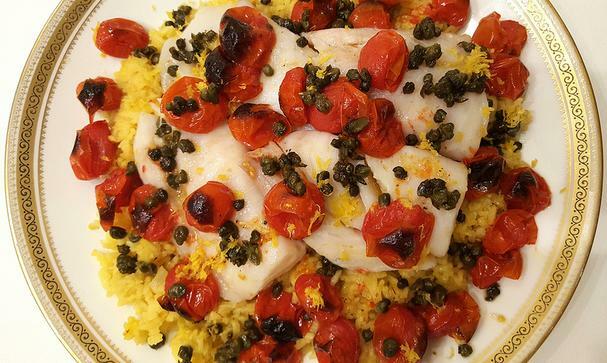 Once the cod is removed from the oven, you can begin roasting the tomatoes and frying the capers. To get the full recipe, head over to the Olive Oils from Spain Blog.